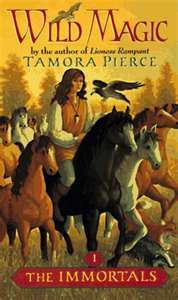 Over the weekend, I re-read The Immortals series by Tamora Pierce. This was the series that introduced me to young adult fantasy. I loved Daine and Numair, the concept of Daine’s Wild Magic, the whole nine yards. I went on to find and read the other Tortall Series (Song of the Lioness, Protector of the Small, Trickster) and the Circle of Magic Series. I have slowly given away the other series, but still hold onto my beaten-up copies of Wild Magic, Wolf-Speaker, Emperor Mage and The Realms of the Gods. I finished each book in about two hours, and was amazed. I don’t know what I was amazed about, but I loved going back and re-reading these stories that I used to know by heart. I think what amazed me, although not in a good way, was the typos, which I don’t think are the author’s fault. The other thing is that, as much I love the books, I don’t read or write that way anymore. These books gave away a lot. Although that could have been me going back and knowing the end. But it felt as if the big surprises were revealed earlier in the book. Athough I love re-reading The Realms of the Gods (the book is actually falling apart, that’s how often I read it), because I lov e seeing all the clues that Numair is in love with Daine. In the prologue, it’s from his point of view and says “He could feel her blink, as if those long, dark lashes of hers touched his cheek. Suddenly, he learned something he never considered before.” And later in the book, Numair catches Daine when she stumbles and she sees something in his eyes and I’m reading it thinking, ‘He loves you!” The only thing is I don’t see clues to Daine’s feelings. And it’s from her viewpoint, so you should see them. And it’s strange to read The Immortals again, because it’s like reading as two different people. My younger, teenage self reads them and remembers what it was like that first time, when it was exciting and interesting and I didn’t notice all the errors. But my older self, who reads the series as a writer, doesn’t agree with all the techniques used. I think there a few reaches. Daine has this great Wild Magic and she’s the daughter of a god; she easily makes friends with all the right nobles and with the royalty; she has two powerful men fighting over her in the second half of the series. 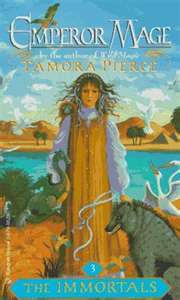 I’m not an expert, or a published author (although I want to be), but I am a writer and at this point, my writing technique/style doesn’t match Tamora Pierce’s. Doesn’t make it bad, just means that I read it with a critical eye. And the one thing that makes me unhappy is that Daine’s story ends with the series. And I love her. I’ve always wanted to know more about her and Numair’s courtship, the difficulties they might have had at court, when they finally married, their children. But that’s my obsessive desire to see a story to the end. Still, everything aside, I’m not throwing these books away unless they fall to pieces. And then I’ll go out and by new copies. Still, I owe them an awful lot for setting my feet on the fantasy track, which I have faithfully stuck to ever since.